Our car was stolen last week, then found 2 blocks away. The shop said it was all fine, ready to go. So we returned the rental, picked up "red car" (which immediately got a kiss, too! ), and headed up. Start, sop, start stop, all over the hills of San Francisco. The most terrifying ride of my life, and my son was in the back seat. Called the insurance, call the shop. J and I unloaded the car into our double-doored, too short to be a garage, perhaps once was a stable, front storage area. The tow truck came and took "red car" away, much to J's concern-- why sick? why broken? come back soon? doctor fix it? Upstairs, his fussing continued, crayons were broken, a toy car thrown. Clearly that ride was as hard on him as it had been on me-- if not harder. I'd planned earlier to make thanksgiving wreaths with him, and started to cut up the cardboard, thinking this would be an activity to distract him, but the crying just went up and up-- I didn't have time. 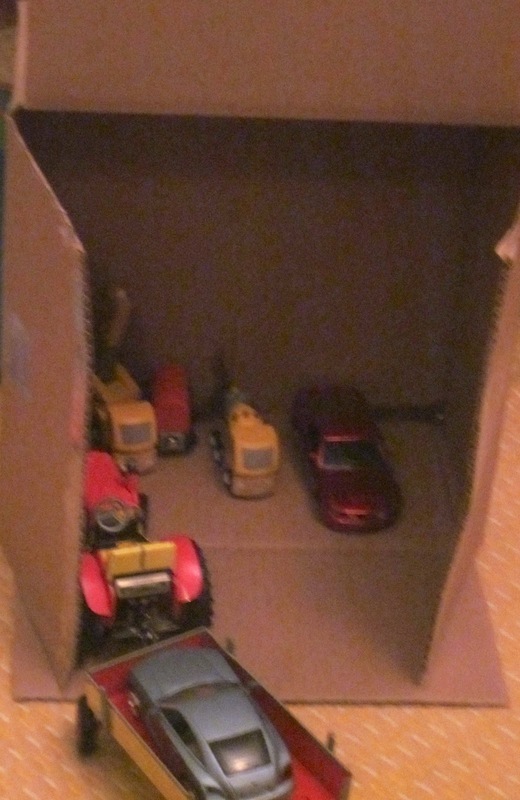 So I turned the box on it's side, said, look, see, it's just like the garage downstairs, and helped him drive some cars in. I left J's room, and heard nary a peep for 45 minutes. When I looked in on him, and took this picture, I felt like a parenting genius-- for discovering that which parents have known for centuries: sometimes, all it takes is a little imagination.